"this isn't a thriller; it is simply an attempt - doomed, perhaps - to describe the indescribable." For those of you like me who never visited Manhattan prior to 9/11 (I had a sweet 16 trip planned for my birthday on September 13th, 2001, which was obviously postponed) the Windows on the World was the restaurant that sat atop the 107th story of the north tower. After Flight 11 hit the north tower, those who were in the restaurant survived the impact, but all eventually died. 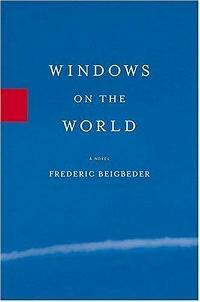 Beigbeder's novel Windows of the World is the fictional account of a father and his two sons who became trapped in the restaurant of the twin towers after the attacks commenced. As you can probably guess, this novel was truly heartbreaking and incredibly moving. No one trapped above the crash site survived so at its center, this is a story about death. I decided to pick it up shortly before Christmas and wouldn't you know, it was the first book I read all year that made me cry. Aside from the poignant subject matter, Beigebeder structures the novel to emphasize the heartbreaking and catastrophic details of that tragic morning; each chapter represents one minute beginning at 8:30am and finishes when the tower falls at 10:29am. Each chapter alternates between the story of the family trapped inside the tower and the point of view of an unnamed French author, ruminating about the nature of America, childhood, 9/11, and the role of a writer. By weaving these two stories together, not only does The Windows of the World memorialize the thousands of lives lost on that tragic day, but it also reflects on what it means to be an American, both pre and post 9/11, and what it means to be human. It explores themes of love and redemption; what we may do differently when faced with death and what becomes important when the end of your life is imminent. What I wanted to tell my sons was that you should never stay with someone you don't love; that you should only be faithful to love and love alone; that you should tell society to piss off as often as possible. The novel as a whole is bizarre and disjointed (as many post-modernist French novels are), but also incredibly powerful and unique. Though certain passages are perhaps brash, self-indulgent, and controversial, the novel is captivating and incredibly philosophical. It will have you reflecting on your own life and the nature of literature itself. A big thanks to my friend Ben for gifting this book to me. This sounds gut-wrenching...in the best way possible. I just saw a movie that was 98% about self-destructive young adults and broken families and 2% about 9/11. It was like, "Are you sad yet? No? Well this whole movie was leading up to 9/11 so go ahead and cry your eyes out now in the last 5 minutes." I may have yelled at the TV. I'm definitely going to have to read this in the coming year. I will keep a box of tissues close at hand. This sounds heartbreaking. I don't doubt that the writing is well worth the attempt, but it might be difficult. Are the chapters rather short (you mentioned each representing one minute), or what's the structure there? As much as I don't like to cry, I'm drawn to this novel...I was lucky enough to visit NYC before 2011 with my newlywed husband...we stood at the top of the World Trade Center (not sure which tower) in the observatory where NYC was sketched out on glass so that we knew what we were looking at all around us. Lots of incredible memories from that trip. Being French I have been exposed to Beigebeder for a while, I am not a fan of his, however your review has me giving him an other chance. Perhaps it is his self indulgence in previous novels which turned me away from reading him. This one sounds hard to read but worth the read. Very interesting in form as well. Thanks for the heads up! Megs, That sounds like an awful movie - like maybe they just threw in the 9/11 storyline to really get people crying? Heather, Do that. Especially near the end. Beth, Yes they were very short chapters. Some were only a page or two and there were very few that were longer than 3 pages. A lot of it it the thoughts going through the character's minds and flashbacks to their early life and childhood, so even though some were longer it wasn't moment to moment in real time. Peppermint, Wow that must have been surreal. Madeleine, This was my first Beigbeder and I wouldn't be opposed to pick up another, but it would really depend on the subject matter. Ben, I did like it! I'm interested to check out 99 Francs. Andi, Exactly - hard but definitely worth it. This looks really interesting. I am not sure if it will be a novel I enjoy but I want to try it from your description.